This is the GE C44-9W SP Southern Pacific diesel locomotive from Kato. 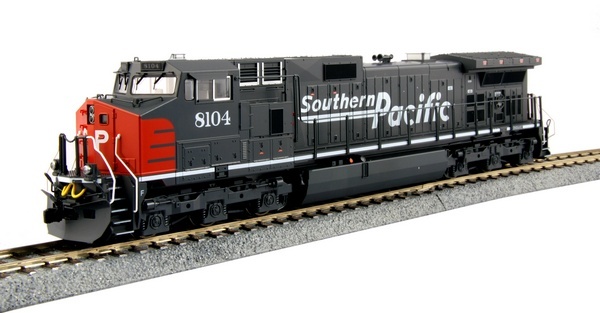 Based on 1990s high-horsepower locomotives built by GE, this model is perfect for freights needing big power to get over the road. Features include fine detailing and working ditch lights along with Kato's smooth, reliable, DCC-ready mechanism. The SP C44-9W’s featured a post Rio-Grande merger scheme with Speed lettering and the iconic “bloody nose” grey and red paint scheme. Many of these C44-9Ws would join the UP fleets and eventually be repainted into the yellow and grey heraldry accordingly. It was not uncommon, however, to see these bloody nose SP units running on UP trains for some time before they were repainted.